Arabia Mountain and Chamblee came away with sweeps in their Class 5A first round state playoff series on Friday. The Rams (22-6) swept Riverwood (13-16) 7-2 and 11-3 to take their best-of-three series and move into the second round of the state playoffs for the second consecutive season. The Rams defeated Villa Rica in a tough three game series last year. Jordan Sterling struck out six while allowing only 4 hits and one earned run in the first game 7-2 win. Corey King improved to 6-0 on the season as the Rams pulled away from a 3-2 advantage to the eight-run victory of 11-3 to complete the sweep. Arabia Mountain won Region 5-5A for the second consecutive season host Flowery Branch (18-15) which defeated Villa Rica on the road in three games by scores of 1-0, 8-10 and 6-3. The first two games of the second-round series are on Thursday, May 3 with a 2:00 pm start. A possible third game would be on Friday at 5:00 pm. The Rams 22 wins is the most in a season for the program and the second consecutive year with 20 or more wins (21 in 2017). Chamblee hosted Maynard Jackson (16-11) in its Class 5A first round best-of-three series and came away with a 10-5, 16-3 series sweep. The Bulldogs had some early errors and walks to open the first game and quickly found themselves down 5-0 in the fourth inning. Chamblee (24-8) picked up a run in the bottom of the fourth and with the bases loaded Travis Hammond roped a line drive over the left field fence for a grand slam to knot the game at 5-5 heading to the fifth inning. The game was tied in the bottom of the sixth and Chamblee’s Hunter Flowers came to plate with the bases juiced. Flowers delivered a bases clearing double to give the Bulldogs their first lead on the way to the 10-5 win. Chamblee was up 5-2 in the third inning but added six more runs to extend the lead to 11-2 in the fourth on the way to the 16-3 game-clinching victory in game 2 at Chamblee. The 24 wins this season is an all-time best for the Bulldogs which set the previous record just a year ago with 22. Chamblee goes on the road to play the Carrollton (26-7) which had to go three games to defeat Walnut Grove in the opening round by scores of 9-1, 1-4 and 10-6 to advance to the Sweet 16. The best-of-three series starts with a doubleheader beginning at 4:00 pm on Thursday with an if needed third game on Friday at 5:30 pm. In other Class 5A state playoffs action, Southwest DeKalb (16-9) was eliminated as North Springs (16-14) swept their series 10-2 and 18-0 while Decatur knocked off Lithonia 10-0 and 5-1 to win that series. A Class 3A top 10 battle is going to a third game as No. 6 Redan recovered from a tough 2-1 loss in the opener with No. 1 Ringgold to force the third and deciding game with an 8-1 victory in the nightcap. Ringgold jumped out early in the third game and held off the Raiders 13-6 to end Redan’s season. The Raiders finished the season 22-9 overall. All three DeKalb entries in the Class 6A playoffs were eliminated 2-0. 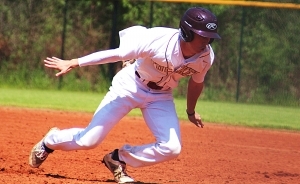 Tucker (17-13) despite having early leads in both games lost 12-6 and 12-2 to Lakeside-Evans (15-11). Lakeside had four homers in the first game including a three-run shot by Will Childers that extended a 7-3 lead to 10-3. Tucker held a 2-1 lead in the third inning of the second game before allowing 11 runs to end the Tigers’ season. Stephenson (15-13-1) went on the road to Greenbrier and dropped both games by scores of 8-0 and 14-1 to wrap up the Jaguars season. Dunwoody also dropped two straight on the day as the Wildcats (14-17) lost 3-2 and 10-5 to Winder-Barrow (21-10). The Lakeside Vikings (14-14) also saw their season come to an end with losses of 9-1 and 13-5 on the road at Grayson (21-11).